I hadn’t planned to write any more blog posts this week. 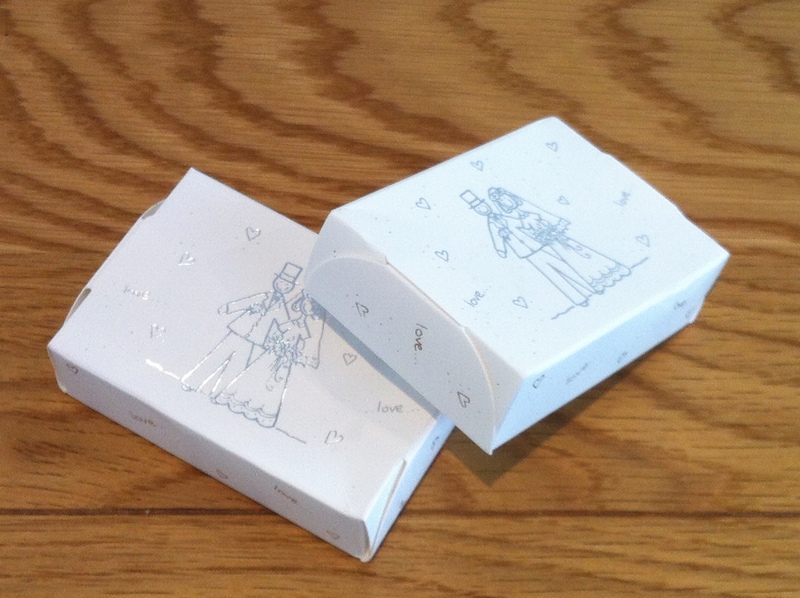 After all, there hasn’t been any baking and I haven’t had the opportunity to go mooching in any lovely local cakeries.Then the postman came, and I had to share the joy the came in the mail…..
How cute are these little cake boxes?! …. Yes people, these little beauties are boxes of cakey goodness. Our lovely friends who got married on Friday sent us each a piece of wedding cake as we were unable to attend their wedding. This is of course quite an old tradition, but not something that I’ve seen done myself. I was really touched – each box has a little message on the reverse – and it was lovely to think that after their wedding, they made the time to sit down and write those messages before they went away. Really I feel we should have sent them cake – after all, it was us who couldn’t attend their wedding! So what do you think peeps? Is this a tradition that should be revived? I often get asked, jokingly, if I could just send some of my cake half way across the world. Well, clearly its possible! I thought it would be a lovely idea to stash away for our big day. We have a few elderly relatives who we’re pretty sure won’t actually attend, but who would really appreciate this little gesture. Oh, and in case you were interested, the cake was delicious…..